Don't fold under the pressure of mounting personal debt. 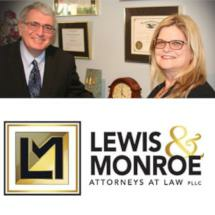 At the Orlando office of Lewis & Monroe, PLLC, we can help you file for bankruptcy efficiently and effectively. With over twenty-five years of experience as a bankruptcy and estate planning lawyer, James H. Monroe has the experience and the know-how to find the debt-relief solution that best works for you. Bankruptcy can be a complicated process, which makes every move you make critical to the outcome of your case. Having operated as the sole practitioner of his Orlando-based office for over a decade, James H. Monroe has more than just the solid legal foundation necessary to handle your case: he has the experience. Whether you are an individual or a business, we can help you get on your way to debt relief. Attorney James H. Monroe is nationally certified in bankruptcy by the American Board of Certification. He is also a member of the American Bankruptcy Institute. In addition to these national credentials, he has several regional affiliations to his credit, including his six years spent on the board of directors for the Central Florida Bankruptcy Association. His writings on bankruptcy have been published in multiple law journals as well. In other words, James H. Monroe understands bankruptcy. The facts of bankruptcy and estate planning cases change, but the needs of the people facing these challenges don't. With over twenty-five years of experience, we have handled cases for clients facing all sorts of difficulties. We understand the hardships you face as you contemplate bankruptcy and the endless options you have when planning your estates. As you step into the Orlando office of Lewis & Monroe, PLLC, we will keep you apprised of every move along the way as we develop a plan that works for you.